As playwright, actor and director, Noël Greig, who has died aged 64 of cancer, believed that theatre has to have a context. There has to be a reason for putting on a play: the best work comes out of collaboration and the audience has to emerge – whether from a grand metropolitan auditorium or a room with a striplight – feeling in some way larger. That sense of context came from the people Noël related to as a teacher, mentor, animateur, artist and gay rights activist.Though by 1972 Noël was working in West End theatre, he felt at home neither there nor even in the racier, “alternative” London scene. More importantly, at a time of the burgeoning gay liberation movement, he felt the work he was doing was not reflecting his true self. So in 1973 he moved to Bradford to join the General Will, a touring socialist collective theatre company. There he became involved in radical gay theatre, encouraging local lesbians and gay men to participate in new work. In 1977 he joined Gay Sweatshop, the London-based theatre company founded in 1975 by Drew Griffiths and Gerald Chapman. It reached out to universities, trade union venues and Campaign for Homosexual Equality groups as well as theatres by telling personal stories. Noël brought historical perspective and a social and political context in his 10 years with the company as writer, director and later administrative director. 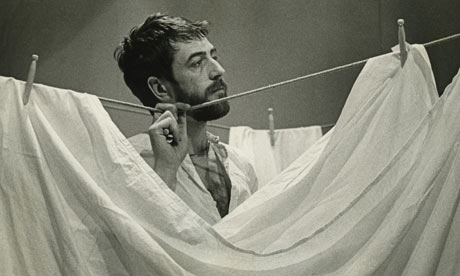 With Griffiths, he wrote the groundbreaking As Time Goes By (1977), the first “historical” gay play, showing repression in three different time-frames: Victorian Britain, Nazi Germany and modern America. Its success led to The Dear Love of Comrades (1979), the story of the 19th-century Utopian socialist Edward Carpenter, which showed the early roots of the Labour party and its distancing from sexual politics. Noël took the role of Carpenter, and in 1984 edited his Selected Writings. Poppies (1983) was a time-shifting, futuristic vision of society on the brink of nuclear disaster and social breakdown. It suggested the leavening effect the gay sensibility might possibly have on the human gadarene drive to self-destruction. Noël grew up in Skegness, Lincoln-shire. His father was a drummer and comedian in the Jan Ramsden Band, which played throughout the summer at the end of the resort’s pier. From Skegness grammar school, he went to King’s College London to study history. On graduating in 1966, he spent a brief spell acting in rep at Harrogate, north Yorkshire, and at Oldham, Lancashire, where he was also assistant stage manager. Then he formed the Brighton Combination with two university friends, Jenny Harris and Ruth Marks. Conceived as a commune with a cafe, bookshop and an experimental theatre studio created by Noël from a former schoolhouse, this was one of the very first “arts labs”, following the introduction of the idea by an American, Jim Haynes, in London. The work in Brighton proved just as innovative, politically radical and iconoclastic. After the Combination moved to Deptford, south-east London, in 1971, Noël worked briefly at the Royal Court Theatre in Sloane Square, and at Inter Action’s Almost Free Theatre – the counter-culture arts centre run by another American, Ed Berman, in Kentish Town, north London. As well as directing, Noël supervised the Fun Art Bus, which travelled along a normal bus route picking up passengers. Then came work as an assistant director on Jesus Christ Superstar in the West End. However, these all turned out to be merely stopping-off points. By the 1980s, Noël had decided that if theatre was going to have any real impact on people’s lives, then it had to address itself to younger audiences. Long associations followed with companies such as Red Ladder, based in Leeds, and more recently Tangere Arts, in the Derbyshire village of Tansley. Plays such as Plague of Innocence (1988), about the Aids panic, commissioned by the Crucible, Sheffield, and extensive mentoring and workshop programmes, made Noël a pivotal figure in the development of playwriting for and by young people. These he undertook with the Royal Court young writers group, Birmingham Rep’s Transmissions programme and, especially, Theatre Centre, working with young people from its home in north London, and later at Aldgate in the East End. In 2001 Noël conceived the biennial Contacting the World, an international festival hosted by Contact Theatre in Manchester to bring young theatre artists together. The resulting book, Young People, New Theatre (2008), reflected the group exercises Noël had developed. It proved as successful as his earlier Playwriting: A Practical Guide (2004), since translated into many languages. Noël wrote more than 50 plays, produced by companies ranging from young people’s theatres to the Royal Shakespeare Company (He Is Ours, 1992); from the homeless people’s company Cardboard Citizens to Graeae, for people with disabilities; and from Theatreworks in Singapore to Prairie Exchange Theatre in Winnipeg, Canada. He often travelled to pass on the lessons he had learned to new audiences. Last April, though already seriously ill, he went to Palestine to help emerging young writers find their voices, directed a performance of pieces by elderly writers in Newark, Nottinghamshire, and led a workshop for playwrights in the East Midlands. Then he went to the holy city of Qom, in north-west Iran, to work with a group of mullahs. For the previous two years, University of Tehran lecturers had based a course on Playwriting. They used his visit to forge links with liberal young clerics, with, exceptionally, seven women participating. Noël took a characteristically lively interest in other people’s lives and opinions right up to the end. He is survived by his mother, Dorothy. David Edgar writes: The General Will was one of the leftwing, agitprop theatre groups that toured in the heady days of the early 1970s. Noël joined the group to direct my play The Dunkirk Spirit, and ended up in the cast. A cartoon history of British capitalism, the play reached its high point in Noël’s performance, deliciously costumed, as the Gold Standard, in a scene whose other characters were the Deutschmark, the Dollar and the Pound. Some way into the run, Noël mounted a coup d’etat (during a performance) against a company which, he argued, shared no common oppression, claiming the General Will for gay rights. More about the temper of the times than the spirit of the man, this action was a protest against a left that dismissed gay liberation as unserious. Noël was the gentlest of people, but he was militant for the causes he believed in and knew that emancipation is never handed to anyone on a plate. Later, he amassed an impressive canon of plays. But his legacy also embraces the hundreds of playwrights he taught and inspired, including more than 300 young people involved with the pioneering Transmissions programme since 1999, through whose writing his work will live on.